Iffley Lock was the site of the first “Pound Lock” to be built on the Thames. It was constructed in 1631 by the Oxford-Burford Commission. A pound lock was simply a forerunner of the system that we see today. A chamber with a gate at each end held firmly against its supports by the pressure of water from upstream. Sluices control the water level in the chamber, so by a combination of opening and closing these gates and sluices the water level in the chamber can be raised or lowered allowing vessels to continue on their journey. The earliest known pound lock dates from 1373 and was on the River Lek in Holland. Portcullis style gates were used by the Italians in the 1400s, and it was Leonardo Da Vinci who is believed to have introduced mitred gates with vertical inbuilt sluices for the San Marco Lock in Milan, completed in 1495. It was some while before the pound lock system was brought to England and used on the Exeter Ship Canal in 1564. The Oxford-Burford Commission was responsible for the second and third pound locks on the Thames that I will shortly discover at Sandford and Swift Ditch, near Abingdon. The current lock was rebuilt in 1924, and is commemorated by a small stone block bridge and landing stage. I am indebted to a retired officer from the Thames Valley Constabulary for this next snippet, which he swears is true. Iffley Lock had certain notoriety in the early 1960s as a suicide spot. At that time the lock sat on an administrative dividing line between three different coroners’ jurisdictions. The lock itself came under Oxford City, and immediately below the lock the left-hand bank was administered by Oxfordshire Coroners Office and the right bank by Berkshire. A payment was offered by the coroner of Berkshire of half a crown (2/6d) for every body that was recovered on his bank. The Oxfordshire coroner would only pay two shillings for bodies recovered on his, whilst the Oxford City coroner would pay nothing at all. I am reliably informed by the retired officer that by some remarkable coincidence all bodies retrieved from the lock were removed on the Berkshire bank, so miraculously generating the maximum reward for the boys in blue. On the other hand the Oxford City coroner enjoyed a far easier life because no bodies from the lock area were ever presented to him for examination. As I continue my wanderings along the towpath I come across one of those little idiosyncrasies which seem to be there just because they are there. 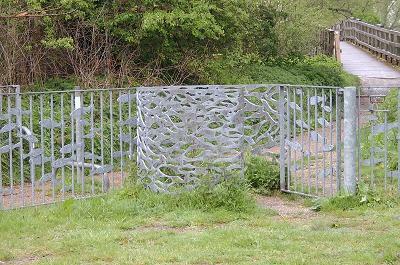 A kissing-gate and surround decorated with metallic fish. The fish are swimming across the gate. What is it doing here? Answers on a postcard please, because I have been unable to discover anything more about this gate. Onwards to Sandford Lock which proudly boasts that it has the greatest fall of water between its gates (2.96m) on the river. The water crashing over the weir can be quite impressive on its day, and today is one of those days. The rain has swollen the river and the “Sandford Lasher” is in full force. In his book “Three Men in a Boat” Jerome K Jerome described the pool below the lasher as “A very good place to drown yourself in” and it is easy to see why. The water rushes over the weir, pounding itself into the pool below. The stretch from Sandford to Abingdon is a return to the loneliness that prevailed before arriving at Oxford. The fields are open again, with the occasional copse breaking into the meadows. It’s back to nature again, and I step out on a long steady southward curve that will take me to Abingdon. Seemingly in the middle of nowhere there is a boathouse. The forecourt is filled with rowing boats of all sizes. This is the boathouse of Radley College; one of England’s most celebrated public schools. One cannot help but compare the recreational facilities available to their pupils compared to those offered by the local comprehensive. An impressive boat house standing on the banks of England’s finest river is a long way removed from the pot-holed basketball court of an inner city sink school. A similar thought was to pass my mind in a couple of days time as I approached Windsor. This time even Radley College would be considered to be comparative paupers, for Eton College possesses a far more impressive boathouse, not to mention being also the proud owners of their own rowing course alongside the Thames. It is so good that it has been chosen as the rowing venue for the 2012 Olympics. Looking across the river I view one of the first examples of something that will become more frequent over the next few days, “Very Nice Houses”. This particular VNH is Nuneham House, which was built for the first Lord Harcourt. The grounds were beautifully landscaped, and Lord Harcourt even went to the extreme measure of having the local village moved so that Capability Brown could have a free rein to beautify the countryside to achieve perfection.